Welcome back to all of you whose kids are returning to Hyndland Primary for the new school year and welcome to all of you whose kids are new to the school, whether in P1 or across the school years. We hope that you and your children all had a great summer, enjoyed the unusual and extended period of actual real summer in Glasgow, but are happy and raring to engage with what lies ahead in the school year. Welcome back also to all of the hard-working staff at the school and we as a Parent Council look forward to helping to support you in your work with our children over the coming year. The new speedbumps are a welcome and long overdue addition to the road safety around the front of the school. Glasgow City Council in their wisdom may have decided to only place the parking meters at either end of the long bend on Fortrose Street, rather than in the critical area in between and right outside the school, but it’s important to consider that trying to avoid paying the meter fee for a brief stop is not an excuse to either disembark small children into the middle of the road, abandon them on the other side to navigate crossing oncoming traffic by themselves, nor to park on the yellow zigzags outside the school. Parking on the zigzags is unlawful, dangerous and, as the sign says, selfish. For the safety of the children, other parents and carers and staff, please be conscientious drivers and parkers. We have a number of social events planned for this school year, but would like to draw your attention to the first of these, a Parent Council School Social for parents and carers, your children and staff at the West of Scotland Cricket Club on Friday 7 September from 6pm to 10pm. Other events include ceilidhs and Halloween discos for everyone and quiz nights just for the parents, carers and staff. We will be looking for volunteers and raffle prize donations, etc., and will let you know in due course and hope that you and your children will come along and enjoy them. It is also really important that as many parents and carers as possible get involved with your children’s learning experiences at the school, whether that’s through the new Seesaw app, helping out at the school, fundraising, or engaging with and through the Parent Council. So, we would be delighted if as many parents and carers as possible came along to the Parent Council meetings, the first of which is the Annual General Meeting on Wednesday 12 September from 7pm to 9pm in the school dinner hall. On behalf of all the parents, carers and members on the Parent Council, we hope that you and your children have a great year ahead. On Monday 14 May Glasgow City Council (GCC) issued a lengthy school consultation on secondary school Placing Requests and School Catchment Areas, which runs from 14 May until 24 September. The proposals that were approved by GCC’s City Administration Committee are available at: https://www.glasgow.gov.uk/index.aspx?articleid=22550. They provide a glimpse on how GCC will propose changes to Secondary Schools’ placing requests criteria, as well as allocating catchment areas to 17 secondary schools in Glasgow. As it is a large scale consultation that will affect many families across Glasgow, it would be advisable for those of you who have children who will progress to secondary school over the next several years to read through the consultation thoroughly and respond. Hyndland Primary School Parent Council will contact parents and carers who have children at the school after the summer holidays (so that the new P1 parents and carers are included), in order to provide a collective response. 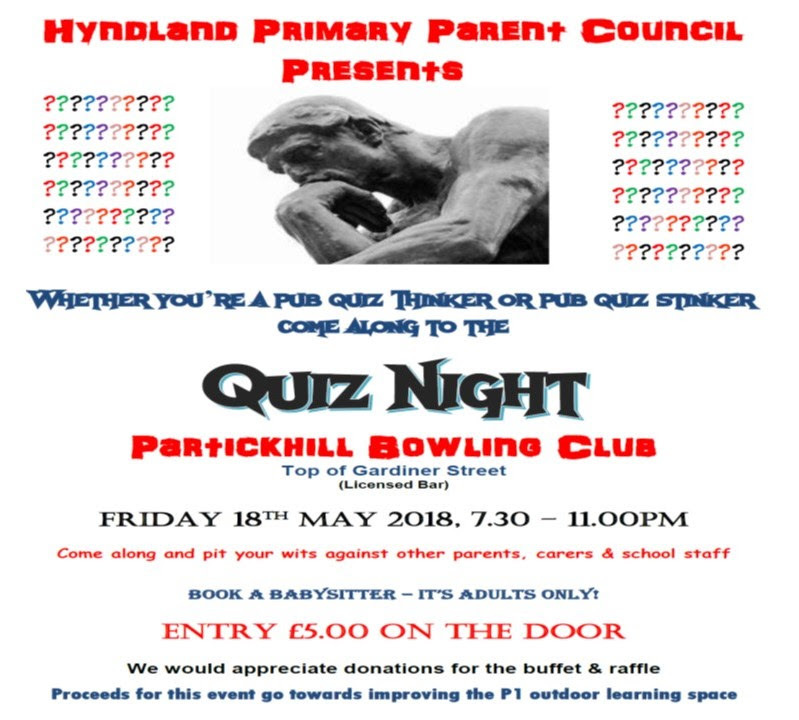 This may be particularly of interest for parents and carers whose children entered Hyndland Primary School as placing requests. Additionally, GCC has now committed to start preparatory work for the consultation to review the admission policy of Notre Dame High School (currently girls only), just after the above is concluded in the Autumn. Over the past 5-6 weeks, the Parent Council has held both a Quiz Night and a Ceilidh and along with the parents, carers, teachers and children who attended, a lot of fun was had and we also managed to raise funds towards the P1 playground developments (from the Quiz Night) and start building some funds towards development work in the other playgrounds. The Quiz Night raise £215 and the Ceilidh raised £250, in both instances these were the profits after outgoings, such as hall hire (and the Burgh Halls is ridiculously expensive! ), band hire, etc. A special thanks to the helpers and everyone who came along, contributed food, tombola and raffle prizes, helped sell raffle tickets, helped clear up, do ‘crowd control’ etc. Your contributions are greatly appreciated as always. Additionally, another special thanks goes to Innis at Basta Pizza, for contributing a bumper gift voucher for the raffle. This is a great example of local businesses supporting their local community and, as such, they deserve plenty of patronage from the local community. Additionally, the Mums on the Run had another very successful Bake Off and Book Sale, raising £307 towards the P7 leaver celebrations. I’m reliably informed that the kids seemed to have a good time, and the parents particularly enjoyed seeing them singing along to Rick Astley and finishing off the proceedings with an Icelandic thunderclap. A big thank you to Marco at Pizza Magic for his generosity in giving the organisers a great deal on the pizzas for the night. Another great example of community spirit and support from the West End pizza-making community! For putting in the hard work on the improvement to the P1 playground, a special thanks goes out to everyone, including the student volunteers from Glasgow Clyde College. It’s looking so much better and hopefully we can get some more parent and carer volunteers coming forward to help continue this work on the P1 playground and the other playgrounds. If there is anyone happy to water the garden and especially playground planters and pollination projects, trees etc., then could you please confirm by text to Susan Taylor on 07882 942 945 that you have done so, including what areas were done. If the plants and garden etc. aren’t watered regularly then there’s every chance that the forecast long, hot spell will start the process of desertification on Fortrose Street this summer. On Sundays the school gate will be open from 11am – 1pm, but Janny John will be in the school on most days over the summer, and the Afty will be open, so access to the school grounds shouldn’t be a problem. Anyone is welcome to text Susan for info about what needs to be done, etc. It has been another great year of learning and teaching and productive activity and development for the children at Hyndland Primary School. They have experienced an engaging curriculum in line with the aims, principles and the four capacities of Curriculum for Excellence – to be successful learners, confident individuals, effective contributors and responsible citizens. Our children have been doing exceptionally well in a whole range of extra-curricular activities in sport, dance, music and outdoor learning, etc. Our musicians and budding musicians have been singing, fiddling, banging the drum and blowing their own trumpets to the delight of audiences in and outside the school. All of our children throughout the school have been acting, singing, running, scoring, playing, helping, supporting and learning their way through another busy, enjoyable and fruitful year. We began the year by welcoming the now not so new Depute Head Teacher, Mr Frame, and finish the year by saying congratulation, we’re gonna miss you and we hope that you enjoy the experience, but not so much that you don’t come back “home” soon, to our one and only Mr Byrne, who has been undertaking headteacher training and has a fantastic opportunity in his temporary position. Fare thee well also to yet another successful crop of P7s heading out to the big bright world of secondary school. To the departing P7s: You will be gone, but not forgotten and your impact on the high schools that you progress to will no doubt be as important as the one that you’ve all left at Hyndland Primary! The Parent Council and also some great helpers and supporters are also either moving on as their children do, or taking more of a back seat from a hands-on approach within the Parent Council, so special thanks to them. We would like to thank all of the management and staff at Hyndland Primary for their continuing, dedicated hard work and patience in helping our children grow educationally and emotionally as they grow northwards. We wish those staff who have had long term absences well and a speedy recovery, and we welcome back some not so old faces. This year the Parent Council has been – as always – finding ways to actively raise funds in order to support the school, by purchasing a range of resources to help enrich the children’s learning experiences. Over the 2017-18 school year you have all helped us raise a few thousand pounds through two ceilidhs, two parent quiz nights, bake sales/bake offs and a Halloween disco. This money has been spent on a whole range of important resources, such as plants and gardening equipment; P1 playground improvements; Christmas books for the children; scientific calculator gifts for P7 leavers, etc. Additionally, parents throughout the school have contributed to raising funds through a variety of activities, such as taking part in Mums on the Run; baking; cooking; making; creating; donating money; donating to or buying from the school Christmas Fayre; Quiz Nights and Ceilidh Nights; sourcing resources at a discount; linking your online shopping activity to easyfundraising.org.uk; buying books through the school book fairs, etc. Thank you all for your kind and generous support. Over the next few years, along with making applications for external funding, we will be looking to raise even more funds to both maintain our current spending commitments and also to raise sufficient funds for the school playground developments, so that our children (well, yours, as mine will have left by that point!) have what is already a large and unusual playground space made into an excellent one. A final, important, note is that as a result of changes to Data Protection law (due to GDPR), we have renewed our parent/carer contact database. So, thank you to all those parents and carers who have contacted us to confirm that they wish to continue receiving communications from the Parent Council, but for those of you who have now, you won’t receive them unless you contact us to strictly confirm. On behalf of all the parents, carers and members on the Parent Council, we hope that you have a great summer break and we look forward to seeing you in August. Except of course for those whose youngest child is leaving Hyndland Primary School – in which case, so long and best wishes to you and your children! The (Nearly) Burns Night Ceilidh was another success on the night. It was much busier than the previous ceilidh at the Hyndland Community Halls and everyone seemed to enjoy the music from Hyndland dad Jamie Smith and his co-band members. After all of the outgoings were paid for the band, hall hire and soft drinks, we made a tidy profit of £400, which was excellent. Thanks to all those who donated food, raffle and tombola prizes. Thanks to Jamie Smith and his band for the music and dancing. 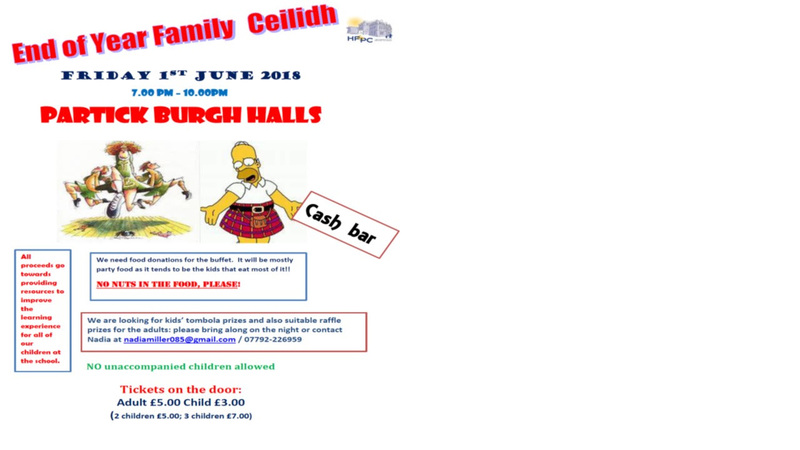 Thanks to Ms Chambers and her two little helpers, all of the Parent Council members and other parents and carers who helped out arranging and preparing the ceilidh, helping set up, sell raffle tickets, staff the door, and with the inevitable big clean up at the end of the night. Much appreciated and you know who you are! The funds from the event and all events and fundraising activities by the Parent Council are used for resources to help improve the learning experience for all of the children at the school.